This report shows that our streets are not getting safer for everyone. Even more so, while traffic deaths impact every community in the United States, states and metropolitan areas across the southern continental United States, older adults, people of color, and people walking in low-income communities bear a higher share of this harm. We’re not walking more, and we’re only driving slightly more than we were back in 2008. Yet even as driving got safer from 2008-2017, significantly more people walking were struck and killed. This is happening because our streets, which we designed for the movement of vehicles, have not changed. 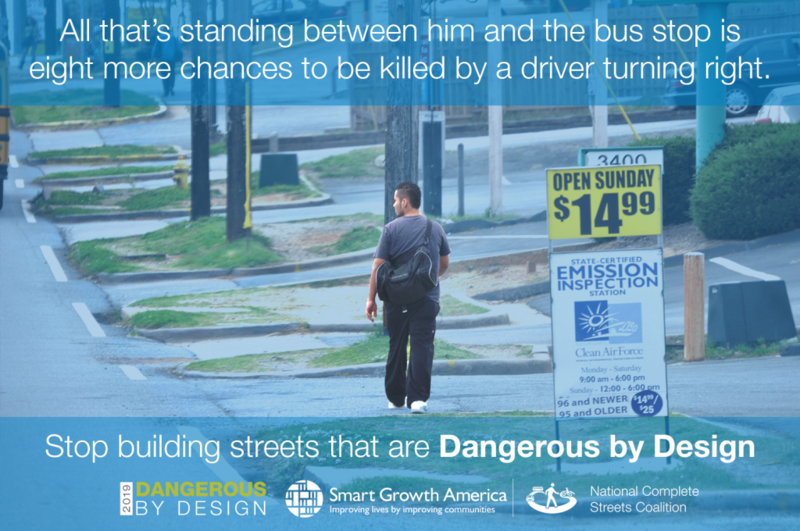 In fact, we are continuing to design streets that are dangerous for all people. Furthermore, federal and state policies, standards, and funding mechanisms still produce roads that prioritize high speeds for cars over safety for all people. To reverse this trend and save lives, we need to protect all users of the transportation system through our policies, programs, and funding. Our federal government needs to take the lead on prioritizing safer streets. Federal dollars and policies helped create these unsafe streets in the first place. And federal funds, policies, and guidance have a significant role to play in fixing these streets and in designing the streets we’ll build tomorrow. We call on Congress to adopt a strong, federal Complete Streets policy that requires state departments of transportation (DOTs) and metropolitan planning organizations (MPOs) to consistently plan for all people who use the street, including the most vulnerable users. We call on state DOTs and MPOs to put people first and give their organizations the tools and training they need to create transportation networks that serve all users. We call on the over 1,400 communities that have adopted a Complete Streets policy to turn their vision into practice and implementation. And we call on you to demand safer streets from the elected officials in your communities. Where are the most dangerous streets near you? This interactive map explores pedestrian fatality data in more detail. This map plots every* pedestrian fatality from 2008-2017. Zoom in and drag, or search for any U.S. address (or city/state) by clicking on the magnifying glass in the lower left corner. Clicking an icon will bring up any available details about that fatality. This map was generated using data from the Fatality Analysis Reporting System, provided by the National Highway Transportation Safety Administration. *A total of 495 fatalities from 2008-2017 were excluded due to poor location data. This table shows the Pedestrian Danger Index (PDI) and other fatality statistics for each of the 100 largest metro areas (defined by the U.S. Census Bureau) in the country. The higher a metro area’s PDI, the more dangerous it is for people walking. Tables are sortable by any column, but default to sorting by the highest PDI (most dangerous) first. More information on change in PDI since Dangerous by Design 2016 and other data are available in the appendix of the full report. Download that here. In addition to metro areas, Dangerous by Design also examines statewide PDI. This table below shows the PDI for all 50 states and the District of Columbia. More information on change in PDI since Dangerous by Design 2016 and other pieces of state-level data are available in the appendix of the full report. Download it here. Stay tuned for more information about the upcoming Dangerous by Design state reports that will include data for smaller metro areas and have more data on vulnerable populations. Register for the 1/24 webinar to learn more. Who are the victims of these tragic crashes? Although people of all ages, races, ethnicities, and income levels suffer the consequences of dangerous street design, some neighborhoods and groups of people bear a larger share of the burden than others. Older adults, people of color, and people walking in low-income communities are disproportionately represented in fatal crashes involving people walking. Even after controlling for differences in population size and walking rates, we see that drivers strike and kill people over age 50, Black or African American people, American Indian or Alaska Native people, and people walking in communities with lower median household incomes at much higher rates. People age 50 and up, and especially people age 75 and older, are overrepresented in deaths involving people walking. This age group is more likely to experience challenges seeing, hearing, or moving, and if these trends are any indication, we are not devoting nearly enough attention to the unique needs of older adults when we design our streets. These disparities become even more pronounced when we account for variations in walking rates by age. 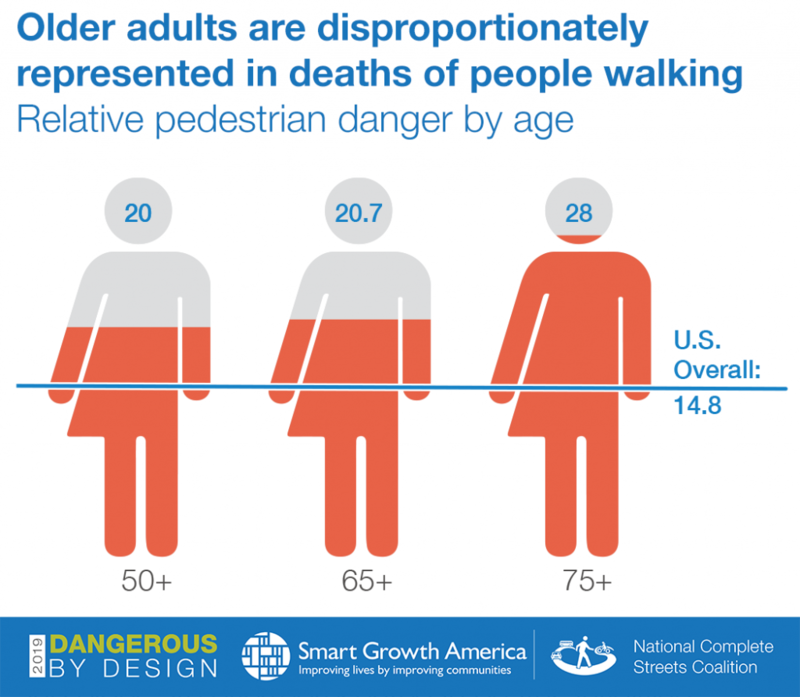 The relative pedestrian danger for older adults age 50 and above is more than a third higher than it is for the general population, and for people age 75 and up it is almost twice as high. Drivers strike and kill people of color, especially Black or African American and American Indian or Alaska Native people, at higher rates compared to White, Non-Hispanic, and Asian or Pacific Islander people. 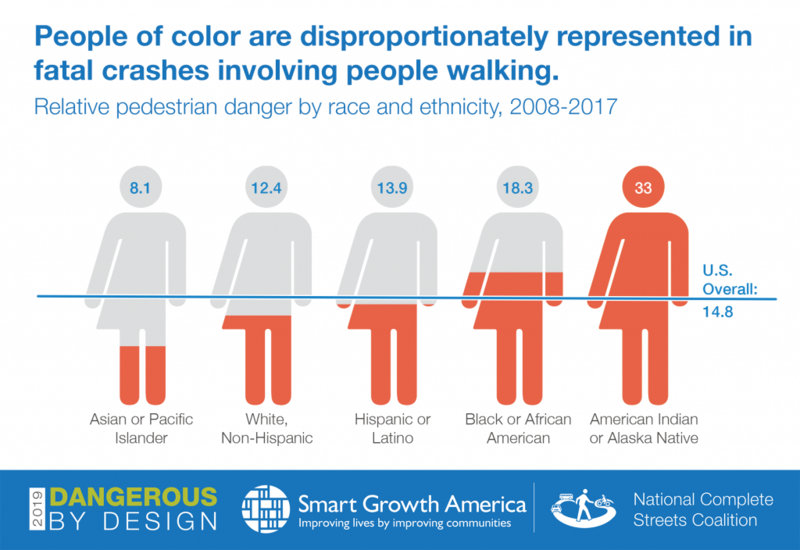 The figure below highlights the relative danger by census-designated racial and ethnic groups of being struck and killed while walking, controlling for differences in walking rates and population size. Although nationwide data do not include information about the household income of individuals who are struck and killed while walking, they do reveal where people are walking when they are killed. 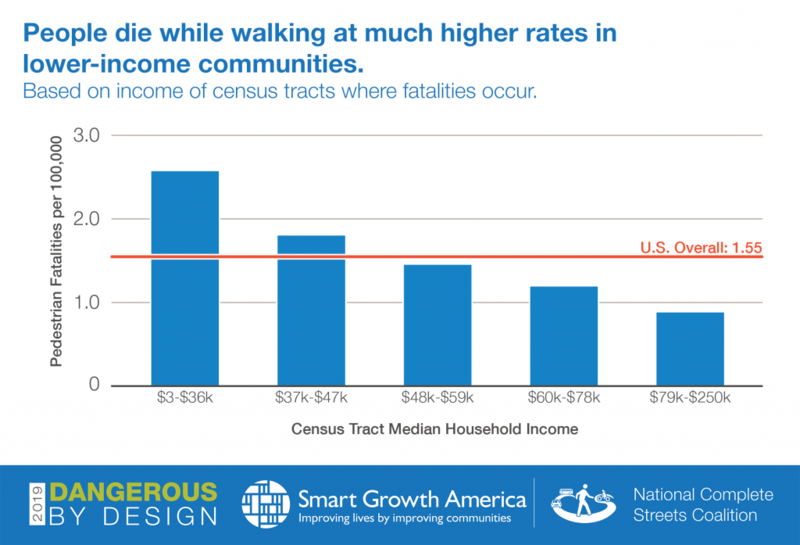 People are struck and killed while walking at much higher rates in lower-income communities compared to higher-income ones. The lower a metro area’s median household income, the more dangerous its streets are likely to be for people walking. This is unsurprising, given that low-income communities are significantly less likely than higher-income communities to have sidewalks, marked crosswalks, and street design to support safer, slower speeds. Protecting the safety of all people who use the street, especially the people most vulnerable to being struck and killed, needs to be a higher priority for policymakers, and this priority must be reflected in the decisions we make about how to fund, design, operate, maintain, and measure the success of our roads. Tell Congress to pass a binding, federal Complete Streets policy. This year, Congress will start work on the next long-term federal transportation spending bill (the current law expires in 2020). Now is the perfect time for Congress to make a strong statement about the need to design for all road users by passing a strong, binding Complete Streets policy at the federal level. No more excuses. No more status quo. It’s time to address the epidemic of pedestrian fatalities. It’s thankfully not a mystery—we have the recipe in our hands. At the federal level, we need a strong, federal Complete Streets policy as a first major step, but here are nine other concrete actions that policymakers, local leaders, engineers, and others can take at the state, metropolitan, or local level. 1. Set performance targets that will improve safety. State DOTs must be held accountable for making reductions in serious injuries and fatalities and should be penalized for failing to meet those targets. They certainly shouldn’t receive funding for plans to increase fatalities. Read more in the full report on page 7. 2. Prioritize safety over vehicle movement. Though states might have a long list of goals or objectives for their transportation system, moving vehicles quickly and efficiently and maintaining pavement conditions generally take precedence. One way to make safety a higher priority is to get rid of the “level of service” design metric. Level of service, used by nearly all states, measures the success of a street solely based on vehicle delay. Minimizing vehiclae delay as the number one goal often produces the roads that are the most dangerous by design. 3. Provide state transportation officials and engineers with the most up-to-date training and education on implementing Complete Streets. In states that have made a policy commitment to Complete Streets, often the professional staff tapped to implement changes lack the knowledge required, or the policies and decision-making frameworks already in place need to be updated to support Complete Streets. 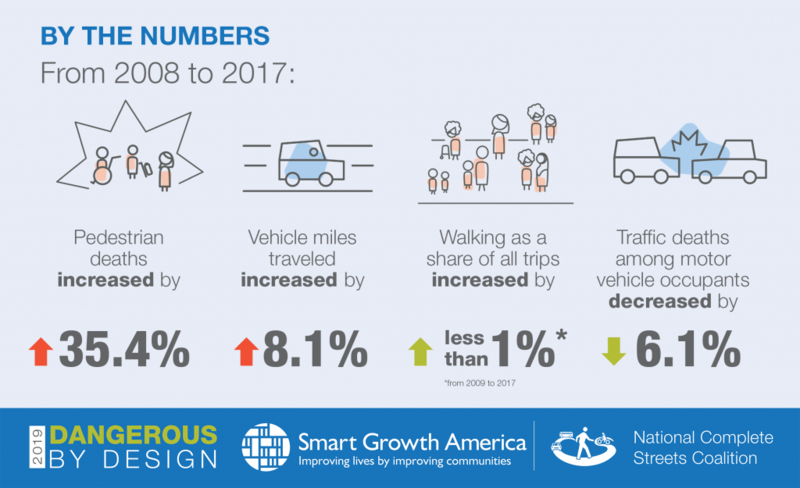 At the request of state or city DOTs, the National Complete Streets Coalition (and other programs within Smart Growth America) have provided staff with the training needed to embed Complete Streets in their day-to-day work and make safer projects a reality. 1. Prioritize projects that will benefit those who suffer disproportionately. Some groups, including people of color and people walking in lower-income communities, are disproportionately struck and killed while walking. To address this, decision-makers should prioritize the projects that would benefit these vulnerable users. For example, the Nashville Area Metropolitan Planning Organization, when deciding which projects to fund in their selection process, awards extra points to projects that will improve safety for people walking or biking in certain disadvantaged areas. 2. Embrace the flexibility provided by FHWA to design safer streets. New design guidance from the Federal Highway Administration (FHWA) in 2016 gave states and cities wide latitude to design streets to best suit local needs and rolled back old regulations that treated all streets and roads like highways. 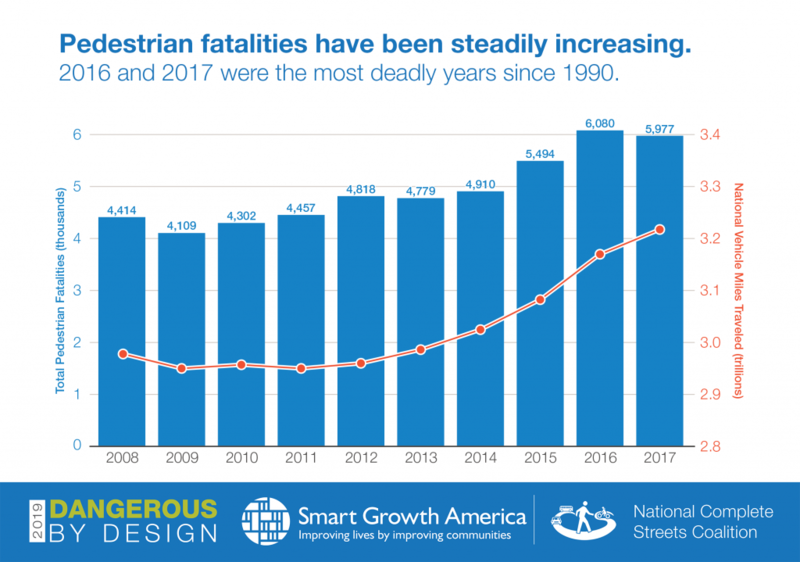 This cleared the way for states, metro areas, and local communities to use federal dollars to design safer streets, yet many states falsely claim that federal guidelines continue to restrict innovative street design. 3. Design roads to reduce speeds wherever possible. For people on foot, the likelihood of surviving a crash decreases rapidly as speeds increase past 30 mph. The federal government already knows that excessive speed is a deadly problem in our nation’s transportation system—the National Transportation Safety Board recently acknowledged this in a powerful report to FHWA. The current practice of measuring how fast most traffic travels on a road and then setting speed limits so that only 15 percent of the drivers are exceeding that limit results in artificially high speed limits—and unsafe streets for everyone. Rather than designing roads that encourage speeding and then relying upon enforcement, states and cities should design roads to encourage safer, slower driving speeds in the first place. 4. Pass actionable Complete Streets policies that lay the groundwork for implementation. The National Complete Streets Coalition’s policy framework provides guidance on how to craft a strong policy that sets up clear next steps to embed Complete Streets in routine transportation planning. 5. Stop referring to pedestrian fatalities as unavoidable “accidents.” City and state leaders should set an example by replacing the word “accident” with “crash” when discussing these preventable deaths. It’s a small change that can make a big difference. Read more in the report on page 22. 6. Test out bold, creative approaches to safer street design. Poor street design is neither an insurmountable nor expensive problem. Some cities have found success by testing out low-cost, short-term interventions to create safer streets and then measuring the results to gauge the impact of their projects to work toward permanent solutions. 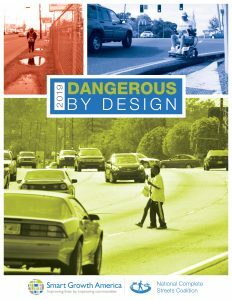 Dangerous by Design 2019 was made possible by the support of AARP, the American Society of Landscape Architects, and Nelson\Nygaard Consulting Associates.